What Really Happened in Rexton? As with all stories, there is always an underside. The following three-part series by journalist and communications strategist/consultant, Dallas MacQuarrie, presents a very different viewpoint than you may have read in the newspapers about the events of October 17, 2013 when police stormed the protest camp set up outside the SWN compound in Rexton, and catapulted New Brunswick into the international spotlight. 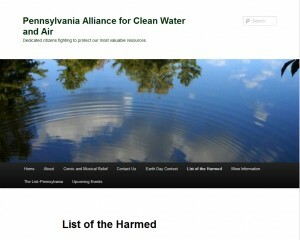 The Pennsylvania Alliance for Clean Water and Air has a common goal of protecting natural resources and the environment- primarily from the dangers of hydraulic fracturing (or “fracking”) in the Marcellus Shale Play. 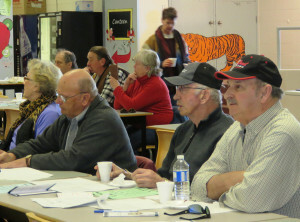 Through public meetings and the media, they raise awareness of the dangers of hydraulic fracturing on public health and the environment, and work to halt activity that threatens the quality of life of the residents of the Commonwealth of Pennsylvania. They have compiled a List of the Harmed, drawing attention to the stories of Real People Harmed by the effects of hydraulic fracturing, and media links to their stories. The list currently has 5000+ submissions. Across the country, fracking is contaminating drinking water, making nearby families sick with air pollution, and turning forest acres into industrial zones. 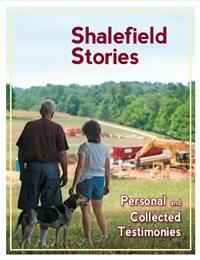 We believe it is vital for the public to hear directly from people living on the frontlines of fracking, and so Environment America Research & Policy Center is supporting the Shalefield Stories project—a booklet designed and published by Friends of the Harmed, group of volunteer citizen-journalists committed to providing support to affected individuals and families living in the shalefields of Western Pa. Likewise, despite calling them ‘world class’, Alberta has few and very weak regulations on shale gas. For instance, unless regulations have been recently changed, Alberta does not even require testing of nearby water wells before drilling or fracking. Despite this, we are constantly told that they have no problems. A recent Alberta website – Alberta Voices – has begun documenting the stories and experiences of Alberta residents affected by a largely unregulated gas and oil industry. These stories are well-researched and available in print or video format.